Shenzhen Yuanrongda Micro Electronic Technology Co., Ltd.
Shenzhen YounRongDa micro electronics technology co. Ltd is a professional semiconductor test program development, manufacturing and sales enterprises, with ten years of research and testing socket making experience, . 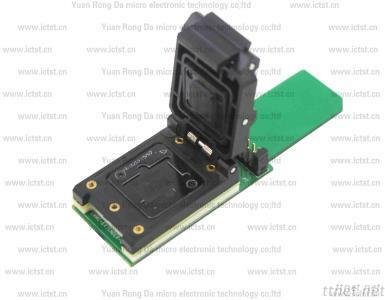 We mainly provide chip test socket, burning fixture, programming device, EMMC / TSOP test socket, camera chip test socket (sensor), automated test socket and connector testing. if there have any chance i can help. Please don't hesitate to contact me! 1. acceptable SD card connect computer directly. 2. Compatible TOSHIBA SAMSUNG HYNIX INTEL, sandisk and all of the same package type 3. MOVI nand or I nand flash boot-rom. 6. Adopt clamshell-roller socket head, easy to operate...7. Press plate of socket head adopt humanization structure, balance press, guarantee IC press equality, and won’t skewing. 8. Crown shape of Pogo pin be able to break oxide layer of solder ball, contact stable, protect solder ball shape. 9. Rationalization locating slot, Guide hole can make sure IC location right. 10. Special IC support plate structure, protect Pogo pin free of outside force. 11...import Pogo pin, BECU plated hard golden, rhodium. Work lifetime over 100000 times. 12. Low cost for maintenance, easy to change pin, cost efficiency. 14. Delivery time: in three days earliest. FUNCTION: help test flash to check if the IC is good or bad, achieve to filtrate chip. Be able to low level formatting by using professional tool, is good helper for SD card, U drive, SSD, PDA, phone, tablet PC and other mobile terminal product company. Yuan Rong Da service protection after sale. Free maintenance after warranty, only charge material cost if there have necessary. Yuan Rong Da free provide related technical support. Yuan Rong Da service before sale. Free train how to use this product.